Interested in a weekend break? At the end of a busy week it’s time to forget work and concentrate on revitalizing the mind and body and what could be better than two or three days break with fantastic live entertainment, sports, leisure and fun? Be as active or relaxed as you wish, after all it’s your time, your choice. And for such a fantastic and relaxing weekend, Khiran Resort will be a perfect choice. 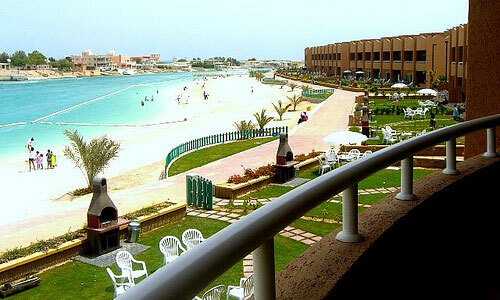 Located in Al-Khiran District, Al-Khiran Resort is about 120 kilometers away from Kuwait City. It is manage by TEC(Touristic Enterprises Company) a semi govt. set up. It has huge landscaping area with proper gardeners and you will no doubt enjoy the ambiance. 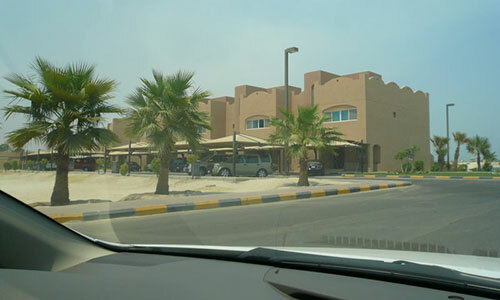 Located on the seafront with the spectacular view of Arabian Gulf sea, it contains total 236 Chalets which comprises Studio apartment ( 48 Numbers), Normal and Royal chalets (148 Numbers) and Villa( 40 Numbers). All the apartments/chalets are fully luxurious and air conditioned which contains a living room, a dining room, a fully equipped kitchen with all the necessary utensils, a bathroom, telephone, a television with its VCR, a terrace and a garage for the car. Prices of apartments/chalets depends season wise and is for (3 days/week end/one full week etc). For a Studio apartment you will have to pay 40 -60 KD/day; Normal and royal chalet will cost you 80 -150 KD/day and Villa will cost 200 KD/day. 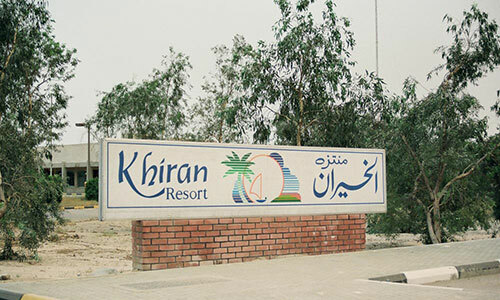 As the prices will vary time to time, you can contact Mr.Khalid - front office manager Khiran Resort @99132563. You can form a group of two-three families and plan your weekend break at the resort. Then you can enjoy more and can also share the price of the chalet. During your stay you can enjoy in the Indoor game centre with video games, bowling alley, snookers etc. And you need not worry about food, as luxurious restaurants are available inside the resort. The three Restaurants are Sea Club (multicuisine), Al Baraha (barbeque/lebanese/arabic food) and Al Bandar(sea food restaurant) will fulfill your appetite. You can unwind yourself in the two swimming pools of the resort; one filled with salty water, and the other with fresh water. If you want to play sports, be it tennis, football, volleyball and basketball, courts are available. 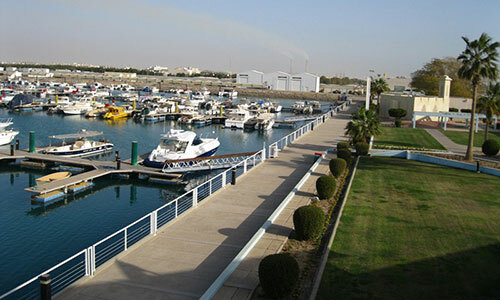 There is a Marina, where around 250 boats can be parked in ABCDE berth and also more than 300 boat park facility on ground. To held special and social events, a huge tent is pitched inside the park. Also, the "Duza" ballroom is available if you plan to organize something special. During the HALA FEBRUARY, celebration in the resort premises with "special fireworks" is the main event every year. More than 600 staffs of different nationality work in the Resort and their accommodations are also provided inside the Resort. Ministry Clinic with 24 hour doctor facility and ambulance is provided. So you need not worry if you fall sick (hope it never happens). Small super market is available in the premises and Shrimpy Restaurant is also available inside the game center. Golf cars are available for staff use and in special occasion Golf car will be provided for guest in coordination with front office. The security department has huge role to protect the Resort with special force. And don’t forget to carry your kid’s bicycles. In case you forget there is facility for various types of cycles on rent. Also you can enjoy horse carriage rides. And if you ever had the desire of smoking the sheesha, then you can fulfill it at the Sheesha parlour of the resort which has lot of flavors to offer its visitors. Far away from the hustle and bustle of the city; far from fully busy working week, this place will give you the right opportunity to unwind yourself and start your coming week with double zeal and passion. can we barbeque in there? i wanted to knw weder dey provide jetskis?? The place seems to be ROCKING.Have to plan out a visit. Thank You for sharing about such a nice place in Kuwait. A perfect place for relaxation, fun and entertainment. We have visited it many times. You will find 1BHK,2BHK,3BHK chalets(prices vary)..can book according to your requirement and budget. We stayed at the resort last year.We were two families and we thoroughly enjoyed. Highly recommend it. Hi, just wanted to know about your normal and royal chalets ,how many bedrooms rooms do they have? Mr Ahmed, you have to pay the entry fee to the resort and can spend the day. nice new information.came to know about this resort for the first time. looking forward for the visit. The staff at Khiran Resort is very helpful and friendly.You will also find Indians among them. If you plan to stay in the resort overnight / rent a chalet, you need not pay any entrance fee. there is no entry fee for kids till 6yrs. Food is not allowed from outside but you can carry chips packets or juice. No problem in carrying your handycam or camera. Even i would like to know whether camera is allowed inside. thnx for the new information.sometimes we keep thinking where to go during the weekend. Can to tell the entrance fees for the Adults,Kids and for Car parking.Whether we can carry food stuffs with us including handycam and camera... ant other restriction you pose during the visit.